The oldest building in Mariposa, and the only 3 story adobe building still in use in the state of California. Erected in 1850 by Col. John C. Fremont and wife Jessie for Palmer Cook & Co., lease holders for the Mariposa Mine and Fremont’s agents. 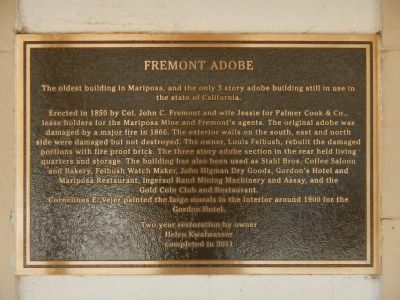 The original adobe was damaged by a major fire in 1866. The exterior walls on the south, east and north side were damaged but not destroyed. The owner, Louis Felbuch, rebuilt the damaged portions with fire proof brick. The three story adobe section in the rear held living quarters and storage. The building has also been used as Stahl Bros. Coffee Saloon and Bakery, Felbush Watch Maker, John Higman Dry Goods, Gordon’s Hotel and Mariposa Restaurant, Ingersol Rand Mining Machinery and Assay, and the Gold Coin Club and Restaurant. Cornelious E. Vejer painted the large murals in the interior around 1900 for the Gordon Hotel. Marker to the right of the entrance. 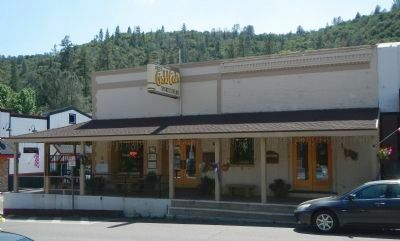 W. Marker is in Mariposa, California, in Mariposa County. Marker is at the intersection of St. Charles Street (California Route 140) and 5th Street, on the left when traveling north on St. Charles Street. Touch for map. Marker is at or near this postal address: 5025 St. Charles Street, Mariposa CA 95338, United States of America. Touch for directions. Other nearby markers. At least 8 other markers are within walking distance of this marker. Schlageter Hotel (a few steps from this marker); Mariposa Independent Order Odd Fellows Hall (within shouting distance of this marker); Mariposa County’s Old Stone Jail (about 400 feet away, measured in a direct line); St. Joseph's Catholic Church (approx. 0.2 miles away); a different marker also named St. Joseph’s Catholic Church (approx. 0.2 miles away); Mariposa County Courthouse (approx. 0.3 miles away); Mariposa County Court House (approx. 0.3 miles away); a different marker also named Mariposa County Court House (approx. 0.3 miles away). Touch for a list and map of all markers in Mariposa. More. Search the internet for Fremont Adobe. Credits. This page was last revised on June 16, 2016. This page originally submitted on May 25, 2013, by Barry Swackhamer of San Jose, California. This page has been viewed 487 times since then and 7 times this year. Photos: 1, 2. submitted on May 25, 2013, by Barry Swackhamer of San Jose, California. • Syd Whittle was the editor who published this page.